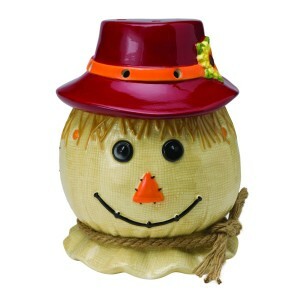 Scentsy Scarecrow Warmer 2015 is adorable, and will look great as part of your fall home décor. The removable red and orange hat conceals his head, where the soft Scentsy Bar wax is gently melting. The Scentsy Scarecrow Warmer uses a 25-watt light bulb to safely melt your candle wax. A wickless candle warmer is perfect for the holiday season because it’s a safer way to enjoy fragrance. This Scentsy Warmer is no longer available, click here for our current Scentsy Warmers.